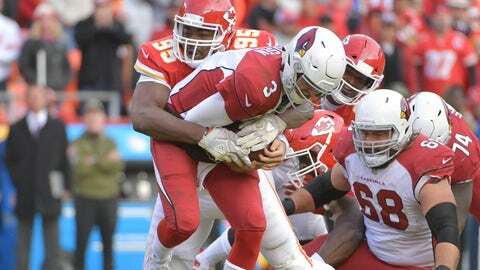 Chris Jones sacks Cardinals quarterback Josh Rosen. KANSAS CITY, Mo. — The Kansas City Chiefs had the Cardinals‘ Josh Rosen seeing red last week. As in a whole lot of red jerseys right in his face. No wonder Rosen was asked, quite sympathetically, how he felt after the game. But the Chiefs did make a couple of other important changes to the coaching staff, replacing their longtime linebackers coach Gary Gibbs with Mark DeLeone and Mike Smith. DeLeone handles the inside guys and Smith handles the outside linebackers, and by splitting up the duties, both are able to give more one-on-one time to their players’ skill-specific needs. He has nine sacks to trail only the Rams‘ Aaron Donald — who will be on the field against Kansas City on Monday night — and the Vikings‘ Danielle Hunter. His total is also tied with J.J. Watt, Myles Garrett and Von Miller, leaving the always-upbeat Ford in some pretty select company. The Chiefs’ Chris Jones has seven sacks, including one in six straight games, and fellow defensive tackle Allen Bailey has a career-best five. Houston has only three sacks because of injuries, but he was back to near-100 percent against the Cardinals, picking off Rosen at the line of scrimmage.